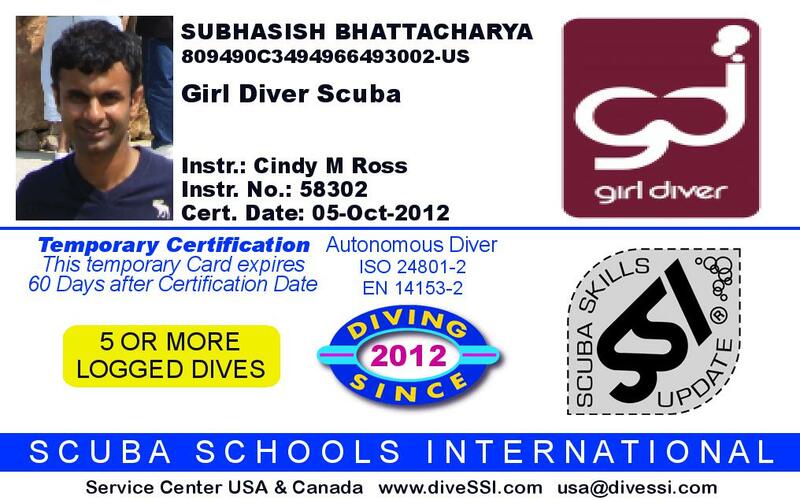 What lies beneath - scuba diving certified!! 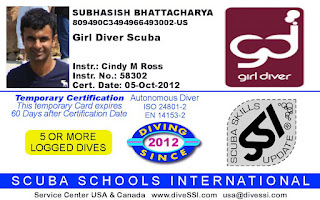 I've had "getting scuba certified" on my list for quite sometime now. Going to Hawaii, Egypt, and the Galapagos Island and being "stuck" snorkeling was not ideal. That said you can actually die underwater if you don't learn your skills properly. There is no stopping to breath for sometime underwater. Therefore, I wanted to get certified in the US/Puget Sound where the standards and moral ethics are high. Besides if I can deal with cold water diving, tropical diving is a breeze. Also, you can't fly for approximately 18 hours after diving so trying to get certified during a vacation is a waste of time. So this was the week that I carved out time to get certified - and certified I got!! AM: Dive to 60m to see an octopus den, a second navigation dive - scuba certified. Now for some tropical dive trips! PM, 6 miles: 4pm, a fast-ish run in yet another nice fall day. Mon - 12 miles: I had accidently gotten my old running shoes without orthotics. It sure was risk running in them but I tried to run on grass to mitigate the impact. About a third of the run was in darkness. Tue - 6 miles: On a cool, sunny morning. I sure am liking this extended summer. Crisp sunrises and sunsets! Wed - 6 miles: A 3:30pm run. The rewards of a run when the sun is out is multiple times that of running in the dark! Fri - 6 miles: On a cloudy afternoon, welcoming fall in Seattle! Sat - 20 miles: Starting at 1pm. The first day of fall was a beauty to run in. Cool with sunny breaks! Mon - 6 miles: After taking a break of 2 weeks! The days sure are getting shorter - I finished in the dark. Wed - 6 miles: One of my fastest runs in a while. Not that that counts for much... I was significantly faster just a year ago. Thur - 6 miles: Easy paced run in pitch darkness... I started at 8:15pm from the ProClub and headed out to the Lake Sammamish trail. Fri - 6.5 miles: After all these runs in the dark, it was great to run in bright sunshine! I snuck out at lunch time to get in a run. Felt great! Sat - 6 miles: On the Bridle trails. Had intended to get in a long run before I decided that I did not need to suffer on these hills and the heartburn from the dumplings I had for lunch was not fun!